Denmark – October 12, 2017​ – On Thursday October 12, Nilfisk was successfully listed as an independent company on the Copenhagen Stock Exchange (Nasdaq Copenhagen). The leadership team, led by Nilfisk CEO Hans Henrik Lund, had the pleasure of ringing the opening bell, clearly stating that Nilfisk, a leading provider of professional cleaning equipment, has reached a historical milestone in the company’s history. “Nilfisk has successfully been a part of NKT Holding since 1989. During this time, we have worked diligently to develop Nilfisk into a leader in our industry, and as a result we have created a strong and financially robust company that is able to thrive independently,” Hans Henrik Lund, CEO for Nilfisk said. At the opening bell ceremony, hosted at the Nilfisk headquarters in Denmark, Nilfisk received a warm welcome by the stock exchange. 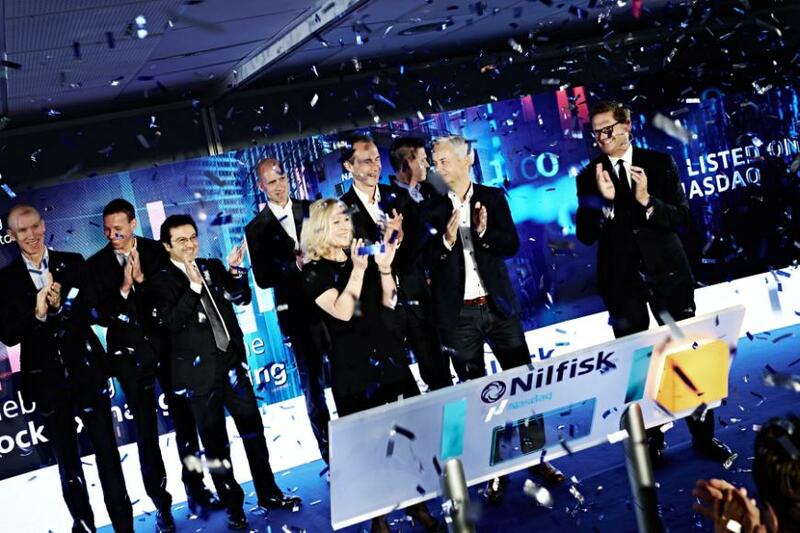 “We are proud to welcome Nilfisk on Nasdaq Copenhagen. The listing of Nilfisk give investors all over the world a unique opportunity to invest in the attractive professional cleaning industry on a transparent and regulated stock market,” said Carsten Borring, Head of Listings for Nasdaq Copenhagen. Nilfisk is a leading global player within the professional cleaning industry. With over 110 years of innovation experience, Nilfisk is dedicated to delivering reliable solutions and products of high quality that pave the way for a safer, more productive and cleaner daily life for millions of companies and private homes around the world. Nilfisk has its own sales companies in 45 countries, and its products are sold in more than 100 countries. Read more at www.nilfisk.com.